Two-toned. CORDURA® fabric reinforced shoulder padding. Mesh material on part of the product. Front fastening with reflective buckles. 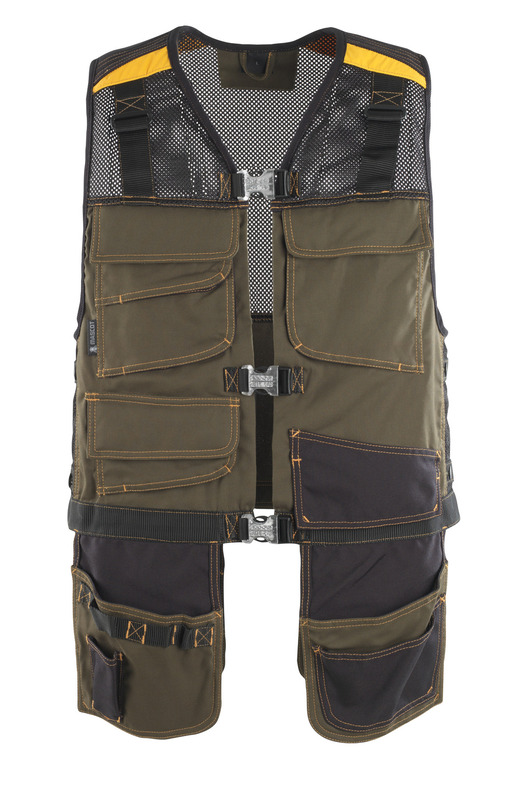 Chest pockets with flap with magnetic fastening and CORDURA® fabric reinforcement. D-ring. Front pocket with CORDURA® fabric reinforcement, flap and magnetic fastening. CORDURA® fabric nail pocket. Holster pockets in CORDURA® fabric. Kevlar® reinforced knife holder in right side holster pocket. Tool straps on holster pockets. Hammer and tool strap. Button adjustment at the side. Orange contrast stitching. Reflectors. Products with magnets must not be used by people with pacemakers/ICD or similar devices due to the risk of a magnetic reaction caused where the magnets are placed.